Hurry!!!!!! For months, we have been looking for a GREAT BUY on a luggage set. While shopping on Amazon, I found this AMAZING BUY! 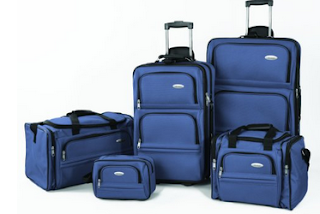 Right now, you can pick up a 5-Piece Samsonite Luggage Set for 34% off plus FREE SHIPPING! This set is available in black, blue and red... What a DEAL! Picking up this set and putting it away for our family vacation this upcoming Spring.